I bought this tool as second hand and bought as unregistered. Today picked up from royal mail and i tried to register the tool under my name. I've done firmware update, i`ve sent info for registration, after 4hrs i've got an email "You recently tried to register HEX-V2 (H11-002625). 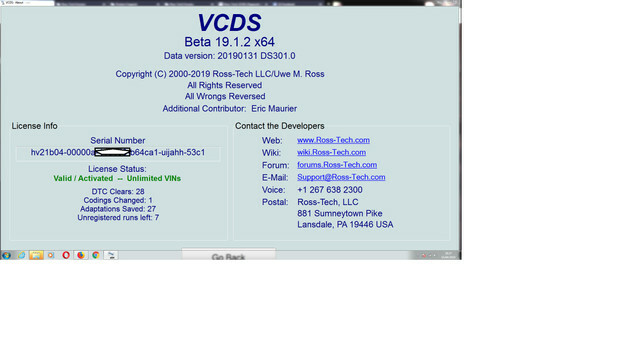 Our records show this HEX-V2 is currently registered to another customer". Strange because the tool still showing 7 runs left / unregistered and the seller keep saing the tool is 100% unregistered and is something wrong from ross tech side. I had similar issue months ago with another tool, but previous owner has called to Gendan and i've got transaction id to my email. Not sure why this happening on my laptop or there is any restriction to my email? Cannot register more than one tool to the same address/under the same name? Any advice on this case please? Appologise but i've just noticed i didn't post on "product support". If someone can move this thread will be great. Last edited by Florin Dobrea; 04-15-2019 at 12:50 PM. The original owner registered it in February of 2018, but apparently did not finalize the registration. In other words the person you bought it from misrepresented it. 1) Get the transaction ID we sent to the original owner from him and use it to finalize his registration. The GDPR nonsense that the EU has imposed prevents us from giving that to you because it will cause some of his personal information to be written to and stored in the interface. 2) Submit a registration with the "Unsupported User" in the name field. 3) Follow the instructions in the e-mail you received and pay to become a registered user. Thank you very much, all clear now. There is no limit time for activation code, should be still valid after 14months? We have more than a year since the code was sent for activation and i`m thinking once if wasn't in use after some weeks/months should be erased from system and with next try should generate different one? Transaction id was found by owner. Thank you for help. Thread can be closed, problem solved.